A unique and high quality effect with unprecedented MIDI control. Far reaching MIDI control. Excellent sound quality. Classic Moogerfooger design. The Moogerfooger MuRF already comes in two flavours, the standard version and the bass version. This latest revision rolls these two variants into one unit with a switch to change the filter ranges between mids and bass, but the most important change is the addition of a MIDI input. 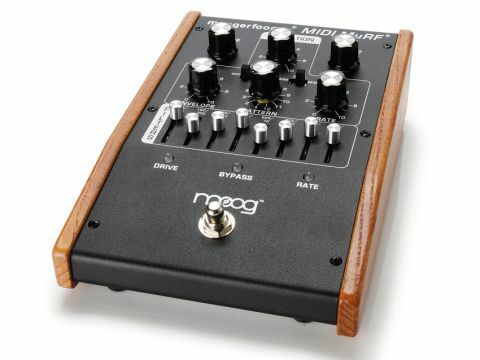 Though the MIDI MuRF still possesses CV (Control Voltage) inputs for parameter control, as with all Moogerfoogers, the introduction of a MIDI input allows for full external parameter controls via this more widespread protocol. Before looking at what can be done via MIDI let's first look at what the MIDI MuRF can do on its own. The MIDI MuRF is an array of eight resonant band-pass filters, the individual levels of which are set by the eight sliders. These filters are controlled by the animation parameters (Pattern, Rate, Envelope and LFO), whilst the Drive (input), Mix and Output knobs adjust the overall effect blend. The animation controls can be adjusted via CV and/or foot controllers/ switches via the input jacks at the rear of the pedal. The Pattern selector accesses 12 animation step sequences per frequency type (toggled via the Freq switch). The first of each 12 has no animation and turns the MuRF into a static filter array which can be used to achieve some lovely scoops and peaks. The LFO switch adds some basic movement to the sound as it sweeps the filter frequencies as a group, though this requires CV or a foot controller to adjust the rate. "The MIDI MuRF is an array of eight resonant band-pass filters, the individual levels of which are set by the eight sliders." The essential character of the MuRF kicks in with the other 11 patterns, which are pre-programmed sequences with anything from eight to 64 steps. These sequences trigger an envelope for each of the eight filters, the shape of which is determined by the Envelope knob (more later). The clever part is that the triggering can either be momentary (on for a sequence step only) or latched (on until the next trigger which turns it off again). This produces rich variations in patterns that may take several revolutions around the sequence to resolve. Changing the filter levels further adjusts the balance within the patterns to radically change their rhythmic emphases. This effect is generally referred to as 'step filtering'. The Envelope control is just one knob and sets the behaviour for all the filter triggers. At its 12 o'clock position the filter attacks and decays are even and resemble a triangle wave, but by rotating clockwise/anti-clockwise the attack/decay is lengthened, thus smearing the filter overlaps in time. Further rotation starts to shorten the whole envelope so a more pulsed shape is achieved, which works wonders for harder rhythmic patterns. The Rate knob controls the overall stepping speed, with a corresponding LED flashing red to indicate it. When a foot switch is used in the Tap/Step socket the LED will flash green to indicate the tempo - a small detail, but it really helps when it's on the floor amongst a mass of other pedals. On the subject of LED colours, the Drive knob controls the input gain and can be used to introduce some smooth distortion into the signal, and so the corresponding LED goes from green (signal present) through yellow (optimum level) to red (clipping occurring). Another detail that impresses us about the MIDI MuRF is that when both output jacks are used the filters are split so that the odd numbered ones go to the left and the even numbered ones go right, which creates great stereo panning tricks. Like all the Moogerfoogers, this unit works its magic on pretty much anything you throw at it - guitars, bass, vocals, drums, etc - though an analogue monosynth really takes some beating for sheer fun. We like the tonal shaping possible in the static mode, and with a foot controller or two plugged in, very pleasing and subtle tone shifts can be coaxed out. Of course when the step sequenced animations come in, a world of filtered rhythmic excitement opens up. The potential for variation between the filter levels, pattern selections and envelope shapes keeps throwing up new sounds, from subtle tremolo filters to vocoder-esque effects to ever-evolving bass pulses. The sound quality is excellent throughout and has enough bandwidth and headroom to make it a flexible studio and performance tool. It's not as universal as the low-pass filter, or as wild as the ring modulator, but there is a wealth of tonal shaping that will suit instrumentalists and producers alike. "Like all the Moogerfoogers, this unit works its magic on pretty much anything you throw at it." So, what can you do with MIDI input? The answer is more than ever. What is really surprising is how far Moog has taken it, as every control can be adjusted via MIDI, even the input, mix and output levels. What's more, it has also introduced a whole other level of pattern control that isn't possible by other means. By sending MIDI clock to the MuRF the step sequence tempo syncs to the incoming clock and the rate knob becomes a clock divider to achieve subdivisions from four whole notes to 1/64ths. This clock subdivision can also be set via MIDI CC09. The manual lists which CC numbers control which parameters, from bypass to LFO rate to bass/mids switching. The filters can also be individually controlled via note on/off messages. The clock syncing is bang on and rate changes don't result in a loss of rhythm, though it can take a fraction of a beat to adjust, and all of the CC controls show no sign of the stepping associated with the 7-bit MIDI resolution. Though sequencing and editing MIDI CCs can become an arduous task the results are well worth it. It also means that the pedal can integrate seamlessly into a MIDI performance setup. By rolling the two frequency types together Moog has created a more flexible sound shaping tool and by adding MIDI has increased its appeal and integration potential by a large factor. The fact that it has gone so far with the MIDI control implementation is a testament to the quality of this product range. The price difference between this unit and the non-MIDI MuRFs is significant but easily justified. Though it may not have the appeal of a more standard effect, such as delay or envelope filtering, it is a unique and high quality tool that is worth the expense for those that want something more original.